If you could grow your business with less stress and pressure… what would be easy? What would “work” without a constant and daily focus by you? What stressors could you eliminate? If bringing in new clients is your answer, then this article was written just for you. The holy grail of sales is generating new clients by referrals. Referrals are so valuable because the prospective new client who is referred knows he or she has a problem that needs to be solved. They trust you to be the one to solve their problem – even before meeting you – because they trust the person who connected them to you. And because they trust you they are less price sensitive and value you more. You may have been taught or come to believe through experience that referrals just happen, are sporadic, and not consistent. Or you may have been told to generate referrals you have to ask for them constantly or use a referral gimmick* to generate referrals. Before we dive into unpacking the 5 steps, let’s first get clear about creating a referral experience and the right foundation for your referral sources. Without the right foundation and referral experience, the 5 steps I will teach in this article won’t work. 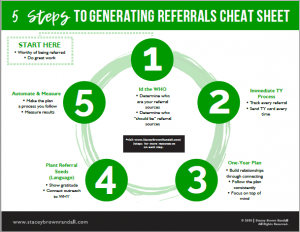 To help you capture the 5 steps in one easy place, please download the 5 Steps to Generate Referrals Cheat Sheet. Everyone deserves referrals, but you are not owed them. Meaning you need to earn them. Earning referrals starts with how you take care of your clients, the reputation you build for serving them well, the results you provide, and how your clients feel about their decision to hire you. To earn referrals you need to deliver a strong client experience; what I call a “sticky” client experience (CX). Now this article is about generating referrals, but you first have to establish the right foundation so referrals can happen. But don’t confuse the client experience (CX) with the referral experience (RX), coming up in the next section. While the CX and RX are similar in some ways, they are different. The CX is delivered to each client. But the RX is layered on top for clients who refer you and we include non-clients who refer as well. But let’s first look at the foundation – the client experience – you need in your business so your clients have the confidence to refer you. A client experience that is “sticky” does three things very well. No one refers crappy or even average work. It is important to put processes in place to deliver “work” consistently with quality and minimal errors. One of the easiest ways to deliver quality work is to take the mystery out of your work. What I mean is to tell your client what to expect, provide a timeline and the issues that could slow down the delivery. Setting expectations upfront is crucial to the client experience along with ongoing communication. You will also need workflow processes that allow you to deliver consistently… think about client on-boarding, how you handle client issues, client off-boarding when the work is done, etc. We naturally want to help those we believe care about us. It is important we connect with our clients more than just delivering the work. You do not need to turn your clients into weekly happy hour buddies, but you do need to foster a relationship. It is important that they know they matter more than just a number on your client list. The best way to do this is to implement relationship-focused outreach throughout the client experience. Show your personal side. Show you care. Show you’re human. And we must do this authentically. Meaning you actually need to care about your clients. Delivering great work and developing relationships with your clients make up the two crucial parts of the client experience you build. But for it to have impact, you have to execute on it for each and every client. Which means you need to “process-itize” it within your business so it becomes part of how you do work. Make it part of your workflow, add it to the checklist, whatever you need to do so it happens for each and every client. Consistency is king and the key to a “sticky” client experience. Now you understand the client experience foundation you need to build within your business. Let’s look at what our referral sources need to consistently refer. If you are going to generate referrals without asking, or without manipulation, you are going to have to create a referral experience for your referral sources. As a reminder, your referral sources are the people who send you referrals or those you want to send you referrals. They are typically clients or centers of influence (COIs). COIs are a subset of your network who know what you do, don’t do what you do (no competitive overlap), and come in contact with your ideal client. I’m going to go out on a limb and guess what you do now to maintain a referral-generating relationship with your referral sources or potential referral sources isn’t experience worthy. Meaning, that monthly automated email you send out or that text or email you send every few months to “say hi” or “check-in” isn’t going to cut it. Nor are those generic cards you mail that you didn’t even sign. You are going to have to do better. You are going to have to create an experience for your referral sources; a referral experience. A referral experience is created through ongoing connections which builds and strengthens relationships with your referral sources. Referrals only come from relationships, it is critical that you have solid relationships that you maintain with your referral sources. The best relationships with referral sources have an experience factor because they make the referral source feel a certain way – appreciated, valued and important. We are experience deprived in our society today. We will rave online or to friends about a wonderful experience we just had in a restaurant because the food was good, the service was good and we were greeted when we arrived. It is because we lack experiences with the brands we interact with, the people we do business with, and the products and services we use. We are so experienced deprived that we over-dramatized what should be considered normal. Think about the last handwritten thank you note you received. Did it get your attention? Were you excited to find it amidst all of your bills and junk mail? Did you place the card on your kitchen counter or desk at work or pin it to a board on your wall? And then when it was time to take it down from the wall or desk – did you by chance slip it into a box with other notes and keepsakes to keep? It was a card for Pete’s sake. While a thank you card isn’t free like an email, it is close to free and a thank you card has 10x the impact on the receiver over an email or text or even call. Because it impacts their feelings. It matters because of what it represented… someone took a moment out of their day to sit and think about you, and then put those thoughts into writing. Someone spent time on you. And as the receiver of that card, you recognized the time and valued it. You should never underestimate the power of impacting someone’s feelings in a very positive way. When people ask me how my referral generating process is different from other ways to generate referrals, I always point to the referral experience. The referral experience is a planned approach to connect with your referral sources in an ongoing way to show gratitude for their trust in referring people to you. The referral experience is focused on evoking emotion and feelings, in which your referral sources feel valued and important to you, because referral sources are the most important part of your business. Most other referral training focuses on the basic outreach to keep in touch with referral sources but when you create a referral experience you go further than just basic outreach like calls, cards, or newsletters. A referral experience goes deeper, with greater impact and it a lot more fun to execute on (yes, I said fun!). A critical part of the referral experience is that it is planned or mapped out in advance. When planning your referral experience, you need to pay attention to 3 keys. The referral experience is always focused on the referral source and makes a connection between your gratitude and what they did for you (sent a referral). That connection and gratitude is shown through outreach, but very special outreach that is designed to be memorable and meaningful. And above all else, everything is intentional and genuine. You will notice each of the three keys of the referral experience are woven within the 5 steps to generate referrals, which we unpack in section 3. The focus of the referral experience is always on the referral sources. Whatever you do in creating the experience you do it with only the referral sources in mind. Your referral sources are the hero and should be treated as such. A referral experience connects in two ways. First, it connects what you are doing, with why you are doing it. Your referral source should understand why you are reaching out. The language you use will make the connection clear to your referral source. And, of course, you never ask for any future referrals. Second, it connects you with your referral source in an ongoing way. A referral experience is not built on a one-hit wonder. Now some of your outreach won’t always hit the mark but a referral experience is the ongoing way you take care of your referral sources. Some might be big gestures. But most will be small, but mighty. This is perhaps the easiest to explain but when violated, can make your referral experience fall apart fast. A referral experience isn’t a manipulative process. It is genuine and works because you genuinely want to show ongoing appreciation to your referral sources. You don’t start a referral experience thinking “I will do these couple of things because it will make referrals happen.” You think “I will take good care of the people who send me referrals and the acts of appreciation will help them remember me when they come across others needing the help I can provide.” See the difference? A referral experience is a planned approach to connect with our referral sources in an ongoing way to show gratitude for their trust in sending people to us who need our help. It has to be planned correctly following the 3 keys of focus, connection, and genuineness. It also has to be maintained and executed on each and every year. Will your new knowledge to establish a referral foundation and what a referral experience is, let’s make sure you can execute on the 5 steps that pulls it all together. Creating a referral generating plan shouldn’t be complicated or complex. There is some work involved to create and execute on a referral plan but following a referral plan beats cold calling, incessant networking or stalking on LinkedIn everyday of the week. There are five basic steps you need to follow to create a business that is sustained by referrals. But these five steps are built with the understanding that you have a sticky client experience and are worthy of referrals (foundation). 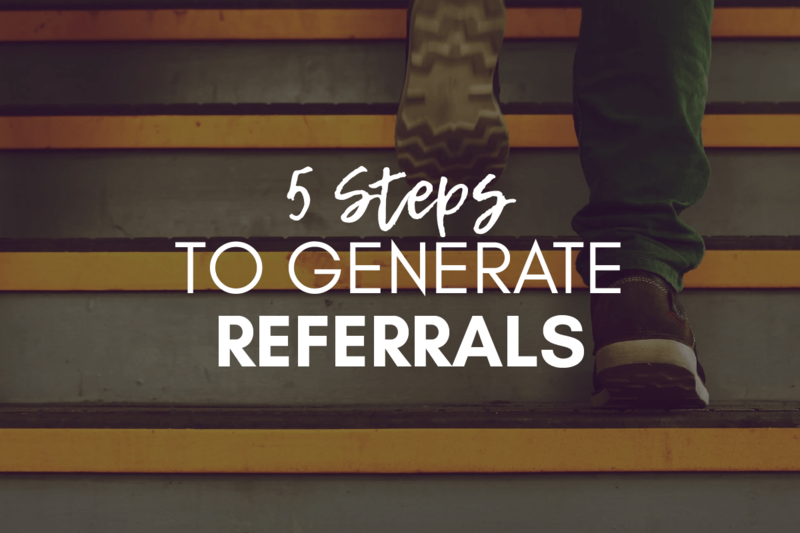 The five steps move you from the foundation to generating consistent referrals that sustain your business growth. To help you capture these 5 steps in one easy place, please download the 5 Steps to Generate Referrals Cheat Sheet. The source is how the client first heard about you. There are many different types of sources including attending a networking event, meeting you at a trade show, finding you in an online search, seeing your sponsorship of an event or charity, noticing an advertisement, receiving direct mail, answering a cold call or cold email and by far the best source – a referral from someone. Maybe you have a CRM (client relationship management database) where you track this information with laser precision. Awesome. You, my friend, are in the minority. But the majority of business owners will need to pull a list of clients, sit down with that list and try to remember where the client came from. Sometimes you can use your memory to remember where your clients came from and other times you may be able to look in files, notes you took during your first meeting with them, in your email, in your calendar, etc. The second way definitely takes longer but trust me – whichever way you need to use to generate the list – it will be totally worth it. A question I receive all the time is “how far back do I have to go, meaning how many years?” I always suggest two years at least but would prefer more if possible. This step takes the most work of the 5 steps but if you do it right, it will be beneficial to you in many ways. Once you have your list, you are just going to focus on those clients who were referred to you. Essentially just create one list of the names of your referral sources. For my online and VIP Growth By Referrals students, I provide them a “Client Look Back” document that makes this process more manageable by giving them a step-by-step process to follow. What if, after completing this exercise, you don’t have enough referral sources? It is okay – don’t stress. Most business owners start in this place. I call it starting from scratch. When you go through your clients to pull out the referral sources – if you don’t have at least a dozen active referral sources identified, you will need to first focus on growing your base of referral sources. If you need to increase your referral sources, it is important at this point to identify who should be referring you, like your clients and/or centers of influence. If you are interested in generating more referrals sources because you are starting from scratch I encourage you to read this article – What to Do When You Need More Referral Sources and check out my Increase Your Referral Sources Masterclass. It is a great place to start to identify your referral sources and learn a step-by-step process to increase the number of referral sources you have. The reason you have an immediate follow-up process to thank for referrals received is because why should your referral sources send you more referrals if you can’t properly thank them for the one they just sent you? So make sure you have a few things on hand so you can execute on a TY process. The proper way to thank for a referral received is through a hand-written note. So you should invest in note cards and stamps. You can buy some inexpensive note cards from a local store or spend less than $100 to have cards printed with your logo. If you want to go a little further with your thank you cards, I encourage you to create ones that are memorable or funny. When you can catch someone’s attention, they remember it. I designed a few different thank you cards for my business that I share with my GBR student and people appreciate receiving them. One of my favorite cards is my Keep Calm and Referral On thank you card. You can download my Referral On thank you card design for free. Tracking referrals should be easy – one of the easiest processes you have in your business. You need to have one document where you capture some basic information – the date the referral was received, the name of the referral source and the name of the prospective new client they referred to you. You can also track outcome – if they become a client or not. The easiest format for a tracker is a spreadsheet. If it helps you, you can download my referral tracker for free. But if you have a CRM, that will work great as long as it captures the referral details. To have a fully functioning referral experience, you need to be sending out thank you cards as soon as possible once a referral has been received. And you need to consistently track your referrals. Remember in Section 2, I talked about creating a referral experience? Step 3 of these 5 Steps is where it all comes together. The outreach that form your referral experience becomes your referral generating plan that you follow consistently. What makes a referral generating plan so simple yet crucial for your business is that it is a plan. One that you have to follow for it to work and one you plan out in advance. A fundamental principle of a referral explosion is to never ask for referrals. It is what makes my system, my process different from others. The secret ingredient for making referrals happen is to weave in language that plants referral seeds. With the right kind of referral seeds, you never need to ask for a referral. what you say during your first meeting with the person who was referred to you and considering hiring you. There are many moments to weave in the right language, to plant referral seeds. It is with this language that we show our gratitude and thankfulness to our referral sources. This language is never manipulative or takes advantage of the referral source. It is completely authentic. While the language piece can seem overwhelming because you want to get the “formula” right, once you understand it, the language becomes easier to create. Within my Growth By Referrals program I provide more than 20 “scripts” or language for many different scenarios and provide 1-on-1 feedback in our student-only Facebook group. If step #3 – the referral generating plan – is the what you do, then this step is how you make it happen. Your referral sources need an experience but you – as a small business owner who is pressed for time – you need a process. A process you can follow so your referral generating plan is executed on. Because it is in the execution of the plan, consistently, year over year that we find real sustainable success. The systematization portion of the plan looks at what you can delegate, what you must do yourself and what can be triggered to happen automatically. Execution is the name of the game for all of this to work like clockwork. Okay, now you have the client experience foundation (Section 1), the referral experience (Section 2) and the 5 steps to generate referrals (Section 3)… Let’s unpack one referral success case study to see how this works in real life. That’s 210 referrals per year. Every year for the past 13 years. And that is just what he has tracked in a spreadsheet (since 2003). Prior to switching over to tracking in excel he kept a list of all referrals and referral sources in the back of his yearly paper calendars since 1977, the year he started his own law practice. From time to time I have people tell me their business is built by 100% referrals. As you can imagine my ears perk up and I want to know more. So I always ask to interview those who have a business built 100% by referrals (or close to it) to see what else I can learn. Which is why my time with David Erdman, the attorney who has received on average 210 referrals a year was so exciting, refreshing and validating. He allowed me in to peel back the layers of how he made it happen. And it was like looking in a mirror. When David talked about what he has done over the years – building his sticky client experience and his outreach to his referral sources – it completely aligns with what I teach the members of my Growth By Referrals community. And that is rewarding and validating. I know what I teach my students works. My results are very real – 100+ referrals every year for multiple years in a row. And my students’ results speak volumes as well from attorneys to financial advisors to realtors to coaches and consultants. But there is something really cool about meeting a business owner who over time has figured out how to generate referrals because he uncovered how and why referrals really work. Understanding the human dynamic and psychology of why referrals happen and what doesn’t work when generating referrals is important to having referral success… especially like the incredible referral success David has enjoyed. What David shared with me that he has done to grow a business based 100% on referrals mirrors what I do and teach others to do. When we first sat down, David walked me through his process as if I was a new client…it was incredible. He set clear expectations up front with a visual process that eliminated any guesswork of what working with him would be like. He listened well and focused on determining if he could help the prospective client. He put in place processes and templates to deliver superior work but also allow him to streamline his work and save time. He focused on building relationships with his clients – one example is his sending a family Christmas card and family update letter each year. Remember the client experience is the foundation to build from to receive referrals from clients. But the reputation and buzz you receive for how you treat and work with clients will impact growing your non-client potential referral sources too. 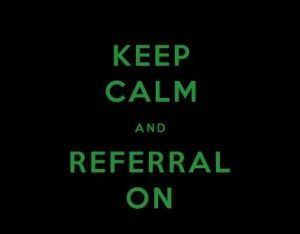 As I have said, referrals come from relationships. One way to build and strengthen relationships with our referral sources is to show the non-work side of yourself, the personal side. With David’s yearly family Christmas card, he sends not only to his clients, but also includes his referral sources. David knows sending a personal Christmas card is an easy way to connect and build relationships. It kills me that I sometimes have to arm twist my clients into putting a family photo on the card. Because remember, people don’t do business with a company and don’t refer a company…we do business with people and we refer people to people. You should be looking for ways to connect on a personal level with your referral sources because we do business with and refer people to those we know, like and trust. David knows the importance of thanking his referral sources with a handwritten thank you note. The impact is so great because writing thank you notes is a dying art form…so we appreciate it more. But you also need to extend the thank you to a year long referral experience complete with ongoing outreach that is meaningful and memorable. Building a business supported 30%, 50%, 70% or even 100% from referrals is possible. David Erdman has been doing it for more than 30 years without asking for referrals, or using manipulation tactics or paying a commission for referrals received. Even if your referrals are inconsistent. Or sporadic. Or non-existent. Even if you don’t receive the majority of your new clients through referrals. Even if you don’t have a system in place to nurture current referral sources. How do I know? Because there’s a process to follow and results speak. My results. My students’ results. And hopefully, one day, your results. 1. Take the free 7 Day Referral Growth Challenge to learn how, in 7 days, to increase you referrals. 2. Take the Referral Ninja Quiz to test your skills and abilities to generate referrals without asking. 3. Schedule a call with me to discuss your current referral reality and what gaps you need to close to generate more referrals. The call is called a Referral Audit. You answer a few questions and then pick a time on my calendar that is convenient for you and we’ll chat. Do you have a tracking device for managing the referrals? Thanks. I saw you speak in Santa Barbara, and was so impressed with your presentation. I look forward to reading your book. Hi Susan. I believe I followed up with you via email but if I didn’t I am happy to get the Referral Tracker in your hands. Let me know!